A barman who survived the Soho nail bombing has been murdered in an apparent homophobic attack. David Morley, 37, from Chiswick, west London, died on Saturday after he and a friend were badly beaten near London's Hungerford Bridge on the South Bank. Six others, including a woman, were hurt in assaults by two youths during a 15-minute period on Saturday. 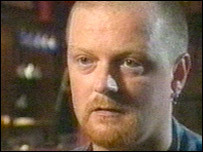 Mr Morley worked at the Admiral Duncan pub in 1999 when a nail bomb killed three and injured 73. He escaped with minor burns and helped rebuild the pub after the attack by David Copeland. Bob Hodgson, the Met's advisor on gay issues, said: "He was a lynchpin in getting the bar up and running again and pulling everyone together and now to have him murdered by these thugs, has caused a real wave of shock and sadness." There was some shock that a homophobic attack appears to have happened in central London, which has a thriving gay scene, on a Saturday night. Among those taking in the news at the Admiral Duncan on Monday was Alan West, who knew Mr Morley for 10 years. "I turned on the TV and thought 'my God, that's Dave'," he said. Unknown Time: Witnesses claim to see a woman being punched in the face near Hungerford Bridge. He described Mr Morley as "outgoing, flamboyant" and "one of the best people I knew." A candlelit march from the Admiral Duncan to the South Bank is being organised for Friday. Det Ch Insp Nick Scola told BBC London: "One of the motiviations was clearly robbery, but in two of the three incidents on the South Bank, the victims were gay. "Until such time as I can be certain they weren't targeted because they were homosexual, I will treat the crimes as homophobic attacks." Two youths, one white and one black, were spotted with two young women during the attacks and stole items from at least two victims. Det Ch Insp Nick Scola said it was unclear whether the women took part and said there may have been more attacks. The group ran off through Jubilee Gardens towards the headquarters of oil company Shell after attacking Mr Morley. A post-mortem examination showed Mr Morley, 37, died from multiple injuries - he had suffered 40 distinct bruises - to his head and body. London mayor Ken Livingstone described the attack as "vicious and cowardly" while London Assembly chairman Brian Coleman said he was "absolutely horrified".